Available as an A6 postcard and as an 8" x 6" mini-print. Original Oil on canvas SOLD. 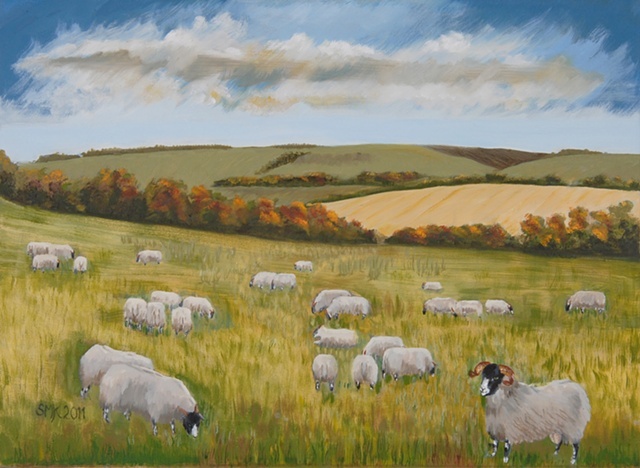 The prize winning blackface tup on the right was admired by my brother-in-law and he commissioned me to paint him. I went down to Perth show to sketch some of the black face sheep and then offered my brother-in-law several rough sketches from which to choose for an oil painting. This handsome fellow, surrounded by all his ewes in his home county of Yorkshire, was his choice.